B+B SmartWorx’s Layer 2 switches offer all the features expected in a managed switch, such as VLAN, IGMP Snooping, Network Redundancy, Link Aggregation, SNMP V1,V2c,V3, Web and Telnet support. Comprehensive network security features, such as SSH, HTTPS/SSL, TLS, TTLS, PEAP and Radius are also offered. Embedded into each switch is the industry-leading IXM™ cross management technology, allowing installers to auto synchronize firmware updates and push configuration settings to either individual or groups of switches. Our Layer 2 switches feature a powerful suite of diagnostic, monitoring and network performance capabilities via a Web GUI for quick and easy troubleshooting. For large-scale networks that require multi-layer switches, B+B SmartWorx offers solutions with full Layer 3 capabilities and robust features. These include static and dynamic routing, Network Address Translation (NAT) technology that gives machine builders and automation engineers greater flexibility and heavy security and redundancy protection. B+B SmartWorx powered by Advantech has introduced its Ethernet switch Security Pack enhancement, which helps defend users from malicious attacks and confidential information leakage more than ever before. The new Security Pack enhancement is available with all EKI-7700 managed Ethernet switches. Learn more. For demanding applications, B+B SmartWorx offers switches that can withstand tough environments without compromising performance. Our managed switches are deployed in industries, such as oil and gas, intelligent transportation (toll collection and traffic management), energy (wind, solar, metering), and security/video surveillance. Hardened and rugged features for mission-critical applications make our switches suitable for installation in field cabinets and harsh areas without air conditioning. For networks in hazardous environments, where exposure to chemicals, dust, airborne fibers, vapors or flammable and explosive gases is a concern, B+B SmartWorx has available managed switches that deliver on performance and reliability without compromising safety. Our switches offer comprehensive certifications for hazardous locations and automation control environments, making them ideal for smart factory and industrial IoT applications. For process control and discrete control applications, B+B SmartWorx offers solutions that add intelligence to the factory floor through 100% compatibility with industrial protocols, such as Allen-Bradley (EtherNet I/P), Siemens (PROFINET) and Modbus; the latest SCADA software; and network status capabilities. Additional features include AOI integration, EDS and Faceplate. Ideal for mid-scale network situations, B+B SmartWorx switches include discrete control, real-time data acquisition and process control/management, allowing you to work smarter, not harder. The EKI-5500 MB/EI/PN Series supports industrial protocols from Allen-Bradley (EtherNet/IP) and Siemens (PROFINET) and integrates seamlessly with top-of-application, SCADA and Programming Tool software. It stands out from competing switches with Media Redundancy Protocol capabilities that support redundant networking and promote “self-healing” following broken connections. With comprehensive certifications for hazardous locations and automation control environments, the EKI-5500 MB/EI/PN Series is ideal for industrial applications. 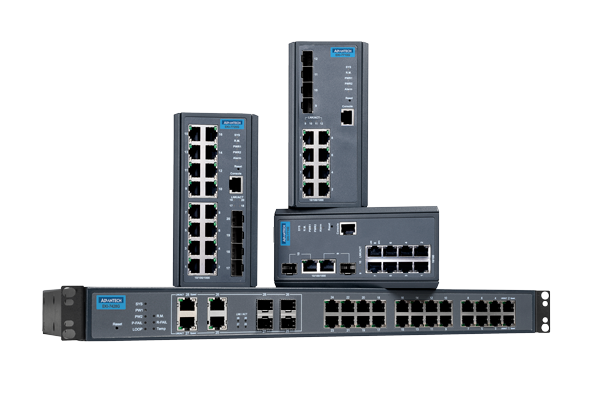 The EKI-7700 series offers the features you expect in a fully managed switch and more. In addition to a rugged design that minimizes downtime and maximizes productivity in harsh environments, its robust management capabilities promote a reliable networking structure. The EKI-7700 offers sophisticated network security, unparalleled flexibility (connect any powered device), significant “future proof” data transmission capacity and comprehensive certifications. Offering full Layer 3 capability, the EKI-9700 Series is the choice for large-scale deployments when comprehensive support is needed for static and dynamic routing. In addition to comprehensive certification support for mission-critical applications and robust security, the EKI-9700 does not require climate control, offering all the flexibility you expect from an industrial-grade, rackmount switch. In rugged situations where hardware is subject to vibration, shock and other environmental variables, rack-mounting is the configuration of choice. B+B SmartWorx offers several switches that offer sturdier rack-mounting options when DIN-rail is not ideal, while also providing the features you expect for large-scale network deployments. The EKI-7700 series (DIN-RAIL & 19” rackmount) offers the features you expect in a fully managed switch and more. In addition to a rugged design that minimizes downtime and maximizes productivity in harsh environments, its robust management capabilities promote a reliable networking structure. The EKI-7700 offers sophisticated network security, unparalleled flexibility (connect any powered device), significant “future proof” data transmission capacity and comprehensive certifications. The EKI-9600 Series (DIN-RAIL & 19” rackmount) is all about unlocking new possibilities. Through Network Address Translation (NAT) technology, it unlocks the ability to build separate machines that use the same IP addresses and communicate with the larger manufacturing environment. In addition to comprehensive certification support for mission-critical applications and robust security, the ability to interconnect multiple LAN segments through static routing differentiates this switch from the competition. When projects require full Layer 3 capability, the EKI-9700 (19” rackmount) delivers, taking the enterprise layer to the next level. It is the right choice for large-scale deployments when comprehensive support is needed for static and dynamic routing. In addition to comprehensive certification support for mission-critical applications and robust security, the EKI-9700 does not require climate control, offering all the flexibility you expect from an industrial-grade, rackmount switch. Additional features include VRRP, OSPF and RIP (dynamic routing feature). As rising energy consumption puts greater demands on utility infrastructure, IoT technology is transforming the power utility market by improving efficiency and strengthening data collection and analysis capabilities. B+B SmartWorx’s managed switches are used in a wide range of utility applications, from smart energy grids and water treatment plants to wind and solar farms. With a rugged design that minimizes downtime and maximizes productivity in harsh environments, the EKI-7700 series’ extensive management capabilities promote a reliable networking structure. Beyond the features you expect in a fully managed switch, it offers sophisticated network security, unparalleled flexibility (connect any powered device), significant “future proof” data transmission capacity, comprehensive certifications, smart PoE management, and PoE/PoE+/PoE++ (400 W) capabilities. The EKI-9700 series offers robust security features and comprehensive certification support for mission-critical applications. It does not require climate control, offering all the flexibility you expect from an industrial-grade, rackmount switch. The EKI-9700 series is the choice for large-scale deployments when comprehensive support is needed for static and dynamic routing.